Teacher participate in an educational project during a Climate Change Academy workshop in April. 2:14 p.m., July 16, 2015--Twenty-five educators from Delaware and Maryland will head to the University of Delaware's Hugh R. Sharp Campus in Lewes on Wednesday, July 22, to study how solar and wind energy could help to address the challenges of climate change. All are enrolled in the third Climate Change Academy, part of a $5.3-million, five-year partnership between Delaware, Maryland and the National Science Foundation. The goal is to develop clear and compelling ways to present the science of climate change to students. As it neared time for the processional to open the University of Delaware Commencement ceremonies, graduating students and faculty members shared their feelings about what the event means to them. It was a day of triumph, cheers and collective relief as more than 160 students from 21 nations participated in the University of Delaware's Doctoral Hooding Convocation held Friday morning on The Green. The partnership – called MADE CLEAR, an acronym that stands for Maryland and Delaware Climate Change Education Assessment and Research – provides resources and research-backed data to educators. This cadre of teachers will meet again Aug. 4 to brainstorm and develop solutions of their own at the Anita C. Leight Estuary Center in Abingdon, Maryland. Climate change may be a given in some circles, an incendiary device in others. But in classrooms across the nation it is either the new kid in town or, more often, not quite in the door. A new incentive exists now to boost climate change literacy, which is part of the Next Generation Science Standards – an upgraded guide to what students in the United States should know and be able to do in science. Delaware and Maryland are among 13 states that have adopted the new standards so far. The Climate Change Academy is part of a growing effort to educate the nation's educators, bringing them up to speed on the science and data analysis. But this is much more than professional development, said Jennifer Merrill, who manages the MADE CLEAR program for Delaware and coordinates research for the Delaware Sea Grant College Program. “Our researchers are exploring how people learn about climate change, while our project is providing hands-on, interactive experiences with classroom resources, leading university climate researchers and education specialists," Merrill said. Alek Petty, research associate at the University of Maryland and the National Oceanic and Atmospheric Administration (NOAA), will address the group in Lewes, speaking on the impacts of climate change. Chris Petrone, marine education specialist with the Delaware Sea Grant Program, will address wind and solar energy solutions and Baltimore City Schools teacher Rennie Watson will present a session on how students can use a framework called "claim-evidence-reasoning" to construct explanations and scientific arguments about climate change. Teachers will visit the University of Delaware’s 2-megawatt wind turbine as the day draws to a close. In Abingdon on Aug. 4, Dana Veron, an associate professor in UD’s College of Earth, Ocean, and Environment, will cover different approaches to adaptation and mitigation and Rob Ferrell of Delaware's Appoquinimink School District will lead a hands-on climate change engineering project. 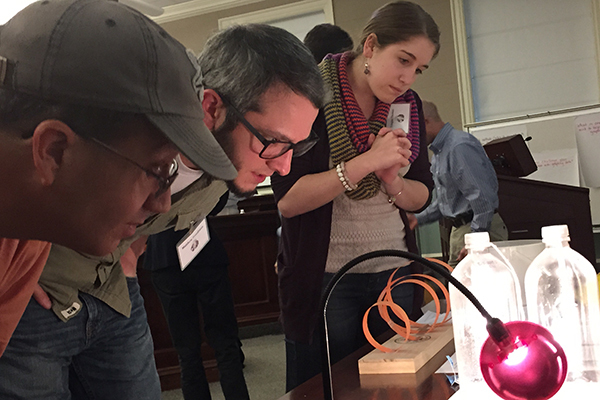 Almost 90 educators have participated in the Climate Change Academy to date, with representatives of a dozen different Delaware school districts and 14 Maryland districts. In addition to classroom teachers at the middle and high-school levels, this year's cadre includes "non-formal" educators from the National Aquarium in Baltimore, NorthBay Adventure and the Midshore Riverkeeper Conservancy. "We need to help the next generation understand what's going on on our planet Earth, what it means and what they can do about it," said Don Boesch, professor of marine science and president of the University of Maryland's Center for Environmental Science. "We chose to do this in a very systematic way throughout two states." Boesch said Delaware and Maryland have much in common but also significant differences. "We share the same general climate and both have extensive low-lying areas susceptible to sea level rise. But when we looked more deeply at the states – in demography and political organization – we saw some distinct differences.... We are trying to understand the cultural and economic differences that exist and how teaching related to climate change differs in those situations." No matter the context, though, the science of climate change offers much for students and educators to explore. "Climate science is so rich in the dimensions of science it involves – physics, chemistry, biology – and it is so interdisciplinary," Boesch said. "It involves integration and it gets students engaged in critical thinking." Teachers say some students – those in high-level science classes, for example – quickly grasp the emergent data and its implications. Others, such as those in a middle school in a struggling part of Maryland, are not aware of how this fits into their lives. "I asked my class how long it would take us to get to the Chesapeake Bay," said one teacher during the group's first workshop at UD in April. Her school is within walking distance of the estuary, she said. "Some said three hours, others 2 1/2 hours. The closest was one hour. They were shocked to learn we could walk there in less than half an hour. My goal is to give them a broader perspective." Educators come away from the academy with many tools to use in the classroom and contacts with experts they can draw on for years to come. "A couple teachers in this cohort are looking at integrating climate change into every unit they're teaching over the course of the year," said Melissa Rogers, education coordinator for MADE CLEAR. "That includes biodiversity, genetics, behavioral modification, ecosystems – there are so many elements of climate change that overlap what has traditionally been thought of as a basic unit." Merrill said the work in Delaware includes the state Department of Education and the Delaware Science Coalition and efforts to reconfigure the state's science kits to ensure climate change is well represented. Weather and climate are statewide science units for eighth graders, she said.